Local SEO is one of the best ways to establish your brand and consumer trust in your area. As a Raleigh, NC Real Estate company it’s important for us to be out in front of the consumers who are searching for us, locally. It’s important to understand that there are major differences between a non-geo specific SEO vs. an SEO campaign that is area based. Local SEO is actually easier in many ways than SEO that is not geo specific because you’re not competing against the nationals brands, as much. For those who are familiar with Search Engine Optimization not much changes from your regular SEO practices. 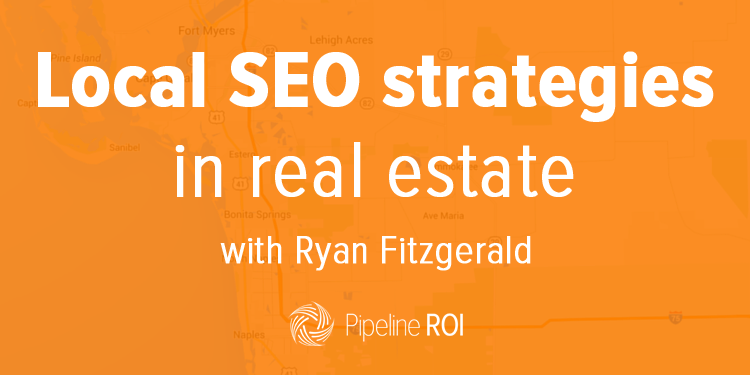 There will always be things that help improve your SEO for your real estate website and things that won’t. My real estate website in Raleigh, NC still competes with the likes of Realtor.com, Zillow, Trulia, and others, however there are local keywords I’m able to outrank them for. For instance, the search phrase “Raleigh Realtor” you’ll find I rank between #2 and #3 behind Realtor.com and above Zillow. Google understands that I’m a Realtor located in Raleigh, NC vs. say Zillow, which is a national real estate marketing firm. 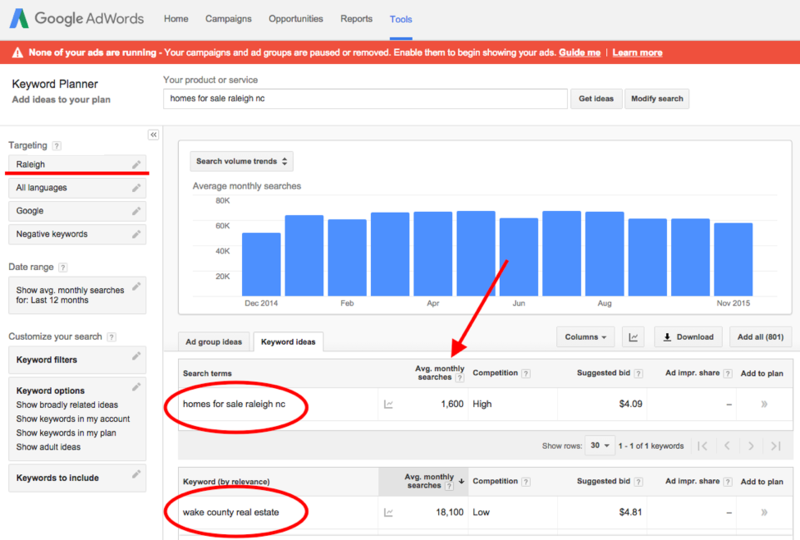 So how do you rank locally for keywords that matter? 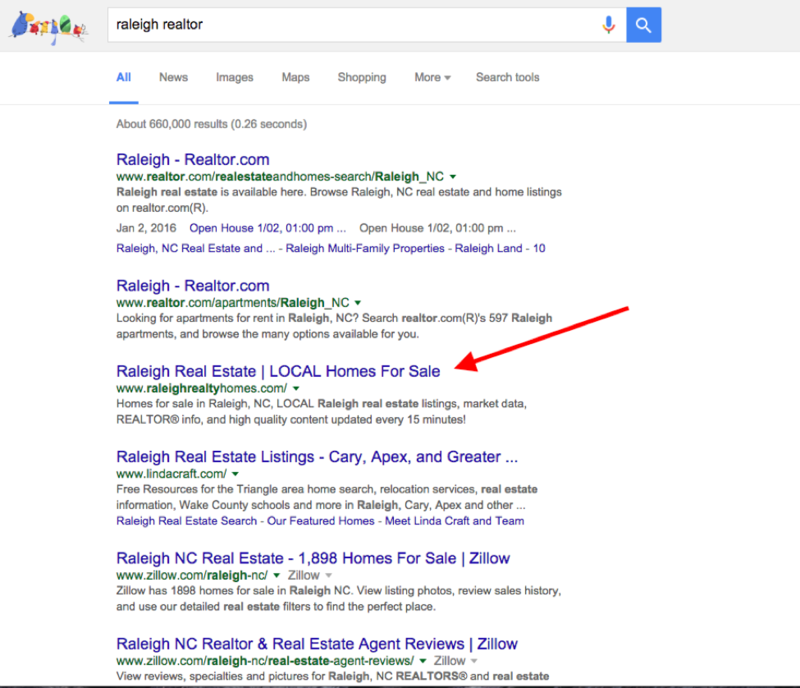 Our Google business page is one of the first things we set up for Raleigh Realty. You’ll see in the image below that we are ‘verified’ and this means Google has sent a postcard to our location to ensure that receive mail at the address listed. This address has a big time importance for local SEO as it will send signals to Google of your location as well as show up on Google Maps and other places. If you haven’t already registered your business with Google you should stop reading this article and go do it. The next thing you need to do is go get a minimum of five Google Reviews so that you have the opportunity to show up in the Google local 3 pack. Five is the magic number to have an opportunity to show up, and more than five increases your chances. You want your business and it’s address to be listed everywhere you can. The more signals you send to Google the better. There is no business listing more important than the one on Google although places like Yelp, Manta, are great spots to ensure your business is listed. It’s extremely important that your address is IDENTICAL in every citation of the search engines will become confused. You can find local citations online with services like BrightLocal and WhiteSpark to understand where your business should be listed. Additionally, you can use Ahrefs or MOZ to see where your competition has their website listed and then go match those citations. Reviews are extremely important for both consumers and for your local SEO strategy. This is a clear signal to Google as to how popular your business is. Total number of reviews, review velocity, and the text used inside of these reviews will all be helpful to your local SEO rankings. We suggest by asking your existing customers and network for reviews on Google vs. Yelp (although Yelp is important) since Google will have a direct impact on your Search Engine rankings. One of the best things about this tool is that it tells me where I should focus my time based on relevant keyword idea’s to drive organic traffic. For instance, “Wake County Real Estate” is receiving 10x greater the amount of searches as ‘Homes for Sale Raleigh, NC.’ A clear indicator I should go create a Wake County Real Estate page. Your title tag will want to include your keywords and your city/region. For instance, our Apex, North Carolina page uses the keywords Apex, Real Estate, and Homes for Sale. This is what our page is about, the keywords we are trying to rank for, and it’s geo-specific. There are H1, H2, H3, H4 tags and so on. It’s important to include your “City” and “Keywords” as often as you can while keeping the user in mind. Our same Apex page uses heading tags like ‘Apex Homes for Sale’ ‘Apex Real Estate’. The word Apex is used throughout the headers and body of the text. You can do two things with your URL structure. You can use keywords and your geo-specific location or you can use just the location. Both are options that will work for your local SEO strategy. We want the weight to be on the word APEX since our entire website is about Real Estate and Homes for Sale. Depending on where you want Google to place the ‘weight’ you can use a shorter URL, or a longer one if it’s a more specific search query. One of the most important factors in determining your local search engine ranking is your on-page content and text. Our Apex page is all about Apex, North Carolina and the word Apex shows up 81 times on the page. It’s included in the title, headers, body, and images. Using alt attributes with a geo-specific location is important for a couple of reasons. One it sends signals to Google on what the page, and image is about. Additionally, it also helps with your Local SEO rankings since the images include the geo-specific keywords. Our alt attribute lines up with our header tags more often than not. One of our alt attributes for this page is ‘Downtown Apex, NC Homes for Sale and Real Estate’ so it’s clear this page is for Apex, NC. Check your on page SEO, and make sure that your geo specific keyword is included in the majority of Titles and H tags. If it’s a community page in real estate If I’m writing a national blog article, I always find ways to include examples of homes that were bought or sold in Raleigh, NC and apply it directly. This keeps a geo-focus on your article for search engines. How can we improve our own local SEO? One immediate thing that could be improved for my local SEO is my business address. At the bottom of my website you’ll see that my office is located in Cary, North Carolina (changing soon) which is going to have a large impact when people search anything ‘Raleigh.’ Because my real estate license is hanging with a brokerage in Cary, NC I’m unable to list a Raleigh, NC address for my business. When I started my Real Estate Company in Raleigh, NC one of the first things I did was start optimizing my website for search engines. Instantly I realized that everything I was creating was for Google and not for the users who were likely to find my website and search homes for sale, locally. Immediately I shifted the focus and started focusing on the people who were searching for specific local properties, and neighborhoods. These pages are much easier to rank for. One of the best things you can do for your local SEO is gain local social media fans within community groups by writing articles that people care about. As an example we wrote an article on Moving to Raleigh, NC that we shared in a lot of local Raleigh Facebook groups. People fell in love with the article and started sharing it all over social media. This helps you spread the word about your business. If you Google ‘Moving to Raleigh NC’ you will see the article ranked #1 or #2. Understanding what Google uses to rank local real estate websites is important for any local business. The above tips are intended to help real estate professionals with a focus on local SEO strategies. These tips will help you attract local buyers and sellers. You’ll want to have a clear understanding of what you’re building your website for, and who you are building it for. Our Raleigh Real Estate website is designed to help consumers who are searching homes for sale understand the buying process and search listings. If you can provide a better search experience for potential buyers you will win clients based off your website alone! Once you have the local traffic, the next step is figuring out how to convert that traffic into clients. Ryan Fitzgerald is the owner of Raleigh Realty, a Raleigh, North Carolina Real Estate Company. Ryan has a passion for technology and helping people find great homes. You can find Ryan and Raleigh Realty on any social media network and you should feel free to connect with them online!